A sudden wave of volatility in the Indian rupee has increased the degree of risk for companies and the financial system as a whole. Over the past three months, the rupee has fallen 12 percent against the dollar and could even slip to the 52 mark if European debt worries persist. Though many analysts foresee the currency clawing back to around 46, they believe that will take a while. Many analysts think this volatility can be linked to jittery investors taking flight from emerging markets and moving to US government bonds. Foreign investors have indeed taken money out of Indian stocks, but the 65 percent correlation between the rupee and the stock market really does not justify the linkage as the impact of net FII outflow was not strong enough to justify the 12 percent fall in the currency. Net FII outflow in August and September 2011 was at around $2 billion which is low for a forex market that trades $75 billion on the rupee every day. “The market was more driven by sentiments than FII movements. Other emerging markets like Taiwan and Korea witnessed more outflows than India but their currencies were not stressed”, says an economist with a leading bank. 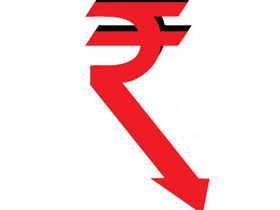 One reason for the rupee’s free fall is the RBI’s hands off approach in the past two years, virtually allowing the currency to float, as economist Ajay Shah points out on his blog. Shah says that while the currency was expected to move by around 8.6 percent, it has in fact moved by more than 12 percent in three months. This is worrying importers and companies that have borrowed in foreign currencies. Worst hit are the oil refiners and marketers as their crude oil import bill will rise. Oil marketer Hindustan Petroleum Corporation (HPCL)’s director of finance, B. Mukherjee, says, “Hedging currency risk is part of normal treasury operations. The external commercial borrowings are hedged on an ongoing basis. With the dollar going up so strongly, they have been fully covered”. 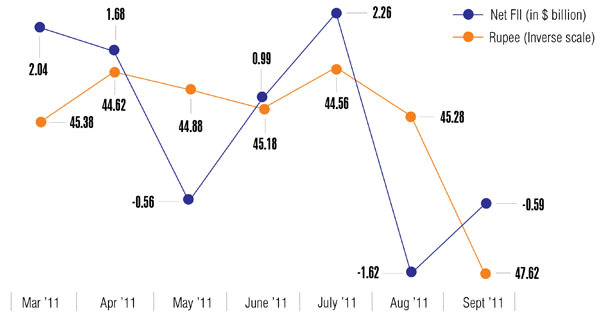 For every one rupee fall in the rate for the US dollar, the loss to oil retailers increases by Rs. 10,000 crore as pump prices are controlled by the government. Many Indian companies have also borrowed heavily in foreign currencies. In many cases these borrowings are short term in nature. According to a Crisil report, these short-term borrowings add up to about $88 billion. Companies expecting maturities soon could be badly hurt by the falling rupee. Those who are hedged will be saved, but if the volatility persists, hedging will become expensive.